My brief hands-on with LittleBigPlanet at the Penny Arcade Expo several weeks ago left me extremely impressed. I didn't get to see the level-building features, but what I saw of Media Molecule's upcoming title was smartly designed, graphically stunning, and irrepressibly adorable. Still, as I downloaded the beta last week I couldn't help but wonder whether it would win over PS3 owners en masse. It is, after all a sidescrolling platformer -- a game type that reached its peak during the 16-bit age. Can LittleBigPlanet hold its own in an era of games built around cinematic narratives and wide-open exploration? After four days with the beta (and they were very full days), I can answer with an unqualified Yes. Contrary to my initial impressions, LittleBigPlanet's humble 2-D roots are far from its defining feature. And they're certainly not a liability. 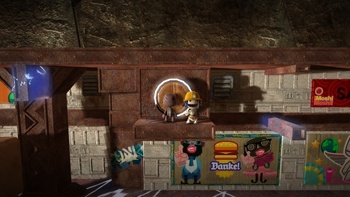 I completed the developer-built levels of LittleBigPlanet's first story section, worked my way through dozens of beta users' creations, and spent about ten hours building my own levels. It was only an hour or two in to the story mode, though, before I realized how much I'd underestimated LittleBigPlanet's gameplay foundation. It's not about run-and-jump 2-D platforming. It's about a system of intuitive physics, and their implications for community content. You don't have to play LittleBigPlanet to see that its physics simulations are front and center. A few minutes of gameplay footage makes that clear. What isn't immediately clear is how these physics simulations are at the absolute heart of the game. Every element in LittleBigPlanet functions as an actual, physical object with lifelike properties. Glass breaks, rubber bounces back, and metal is indestructible. Simple winches, levers, motors, and springs work exactly as you'd expect. The infinitely variable contraptions and structures I saw in every level, user-built or otherwise, didn't rely on mysterious technologies. They were built from the simplest of tools and materials. In LittleBigPlanet's shrunk-down world, all this stuff is up close and personal. If you're hopping across a forest of plush, cloth-covered trees you'll see the stitches in their seams. You'll notice the corrugated edges of your cardboard house and the woodgrain in your pinewood derby racer. Even your Sackboy, zippered and stuffed, is a comfortingly familiar physical object. The end result is that LittleBigPlanet doesn't feel like a world created from polygons and texture passes. It feels touchable and explorable. Its levels don't seem like they were built with software, they look like they were arranged by human hands. LittleBigPlanet seems more real than other games, and it makes sense in ways few other games do. These fundamentally realistic, familiar qualities make a big difference when you're working with LittleBigPlanet's level creation system. It's easy to create and place physical objects, stickers, tools, and the like. You can try out your creations in real-time as you build, and assembling a simple platforming level is a snap. More detailed levels, especially those that employ hand-built machinery, take a lot more effort. Thankfully, the game includes a robust set of tutorials that slowly unlock the more challenging tools.